[New for 2012] Back in January, I was jonesin' to try a new Talenti flavor but it's been forever since I've seen something different. I know some of you dig banana flavors way more than I do (like my wife), so I decided to pick this one up in the hopes of taking a few test bites and then pawning it off on her. 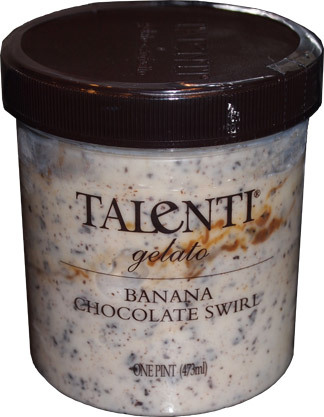 "Deliciously rich banana gelato is blended with a golden Argentine caramel swirl and bits of elegant bittersweet chocolate to create a bold flavor reminiscent of the best banana flambé." So I hand a bowl over to my wife first since deep down this pint is for her. She starts eating but doesn't really say much. I get myself a single scoop but decide to offer it to my daughter instead. She gets a whole ONE bite into it and makes the BLECK face. Wow, she's usually a trooper but she's going with the one and done here. My wife chimes in that it takes a little getting used to. Well, it's Talenti, so it can't be that bad right? I take a whiff and it's a bit disconcerting. Rather than smelling banana (i.e. the inside), it smells more like a banana peel. I take my first bite and WOW is that totally not what I expected. On the one hand, the mature part of me is trying to tell me it tastes like a nice banana bread. On the other hand, the immature side of me almost spit it out into the sink. My wife chimes in again to say that the chocolate chips help, and I agree that they are a nice thin crunch, but that's not enough for me. There's also a nice looking swirl but the caramel flavor is totally buried. I try to press on but I'm having trouble. I decide to bury mine in nesquik and while it does help, the banana peel funk is still riding high. 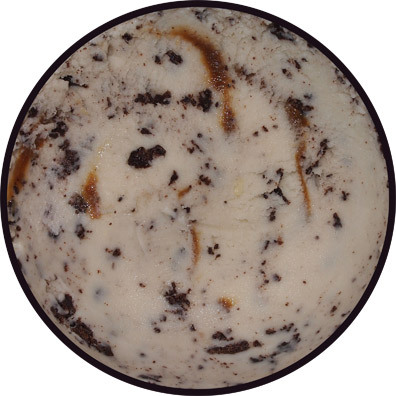 As always, Talenti has delivered a unique treat with a fine texture, but there is very little of me enjoying this treat. My wife offers to finish it so it doesn't go to waste, but I think we'll make this the only banana review of the year. On Second Thought: So you know how a green banana is flavorless, a yellow banana is nice and sweet, and than a really spotted banana kinda has this twist to it? I think that's what I taste in this pint, it's that very ripe flavor twist. As always, they've nailed the banana taste, it's just not the way I prefer my bananas. Nick’s Note: Okay, so I just tried this flavor and I have to agree with Dubba. I’m normally a fan of banana flavored dessert but this one is a bit too ripe for my liking. The caramel and chocolate bits are tasty but unless you get a good amount of them, the base just takes over. I wonder if the ripeness varies from batch to batch because others have said that they love this flavor. I’m not saying it’s a bad flavor by any means but with the banana flavor being so ripe I can’t say I’d be picking this one up ever again. A banana is not ripe until it gets brown spots. I tried their previous banana without caramel, and the flavor was ok.
Just tried it for the first time today; yummy! The first hit of banana was a little odd with the first spoonful, but it seems to mellow out and blend nicely with the chocolate and caramel, offering up a nice banana-split taste. I agree with the original reviewer. This flavor isn't bad by any means, but the banana is a little overpowering and not quite the type of banana I go for. Am I enjoying it? Sure. Was it fun trying a new flavor? You bet. Would I buy this flavor again? No.